Embodied is My Politic. Art is My Love. Over the past year I have been preparing for a new chapter in my life as an artist/maker. The new project, driven largely by a need to get back into the studio full time, is an unapologetically commercial venture. Interfacing with the growing movement of legalization of weed in the US I am launching a bong/smoking accessory company called Bong Monsters. The initial phase of the project focuses on slip cast doll parts for the creation of the objects. The problem with this is my limited experience in slip casting. While I have worked with the technique in grad school it’s never been my specialty. In addition to reading and watching videos on the subject I decided to have my friend from school come down and run me through the basics again. I’ve made many molds before but it’s an incredibly demanding skill that I have never been completely comfortable with. Choosing a slip cast driven project then was either a poor decision or an opportunity to learn new skills. I’ve opted for the latter, which is why in part it is taking so long to really get the project moving. April coming down to help this month has been a huge step toward competence in this area. When I first considered this idea I was focused on where I needed to be rather than where I actually was, if that makes any sense? I wanted to work out multi part mold construction and various material techniques but on further reflection I decided what I needed most was a stable foundation to build on, so opted to have her demonstrate the most basic two part mold. I threw some bong necks for the purpose, which is the part I most urgently need to start prototyping, and we worked with those. 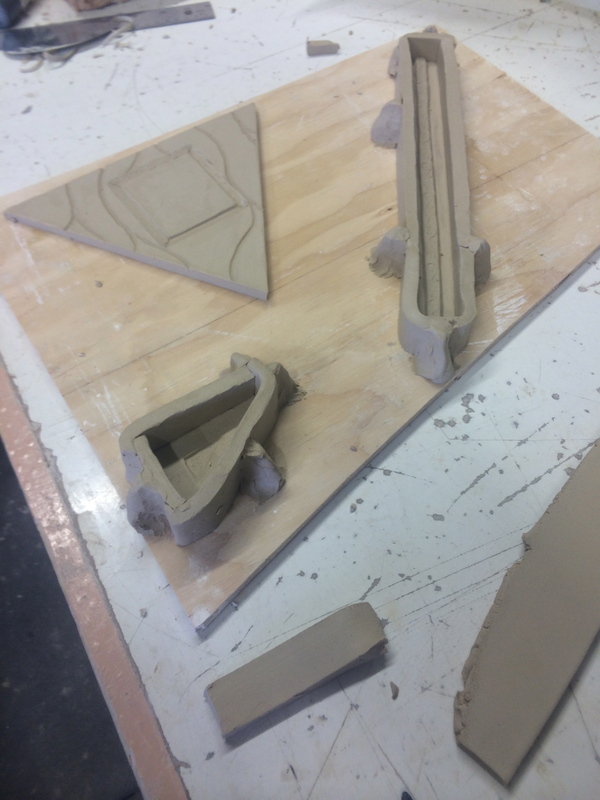 While the pieces we used as models were leather hard clay, April recommends either soft bisquing models to cone 014-012 or reductively sculpting the model from a solid block of plaster. Here is April getting started with the model. She recommends applying, then wiping off, 3 coats of mold soap. Here we used Murphy’s Oil Soap, but Dr Brauner’s Pure Castile Soap works too and can be selected without scent. Mold soap is diluted to one part soap and one part water. 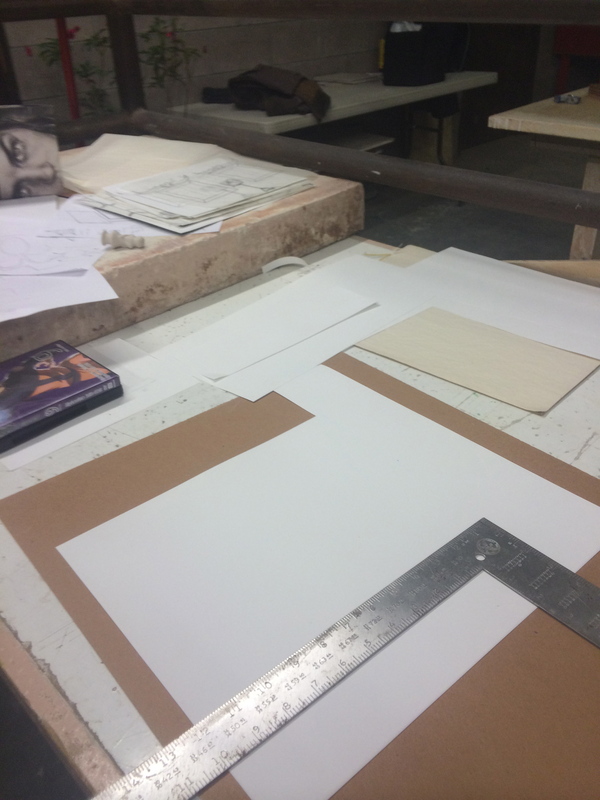 Finding the dividing line is one of the most important parts of making multi-part molds. The principle on a simple object like this is to divide the object in half using the widest point in circumference. On more complex forms the principal is the same, following the variable line dividing the object to avoid undercutting so the mold may be lifted cleanly from the cast object. April recommends looking at toys for an understanding of multipart mold construction as the dividing lines are often discernible on the object. 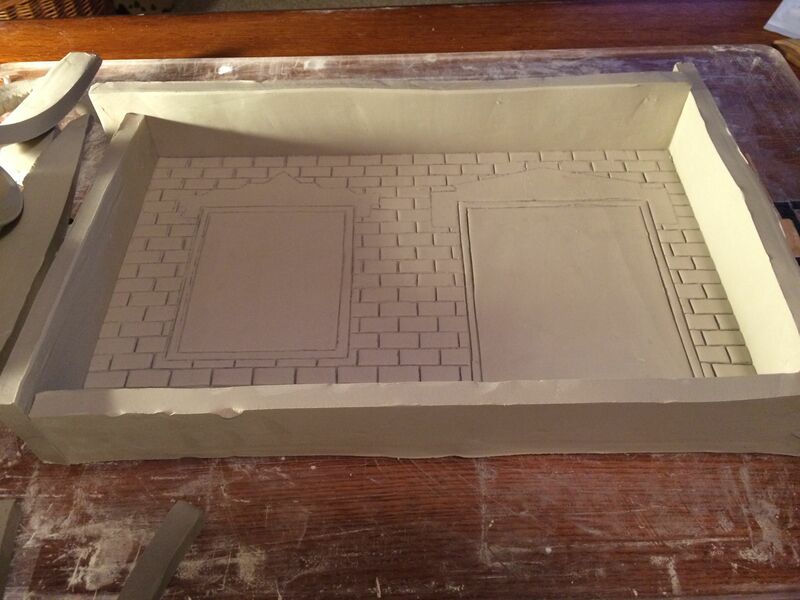 Once this step is complete, it’s time to clay up the bottom half of the model so the top half can be cast in plaster. The model is immersed in clay up to the dividing line and then walls are built around the entire construction to contain the plaster. Normally cottle boards would be used, but mine were unavailable so we made due by building clay walls. All gaps were filled and the area was leveled and cleaned in preparation for the plaster. April recommends working with plasticine for filling in most gaps when using cottle boards as it will not dry out and can increase working time. Calculating for the amount of plaster needed is a simple matter of multiplying L” x W” x H” of the area to be filled and dividing that number by 80. That will break the calculation into quarts. Rather than using a pre-determined formula for the plaster April uses the island method, putting the prescribed amount of water into a bucket and then slowly adding plaster until an island of the material remains above the water line. Once the prescribed amount of plaster is added, the mixture is allowed to hydrate for a few minutes and the mixed by hand. Other methods for mixing can be used but care should be taken not to add air bubbles that can cause problems on the surface of the object to be cast. Once mixed the plaster is allowed to sit another few minutes while agitating the bucket to remove more air bubbles. Setting times for plaster vary depending on the temperature of the water used in mixing. As the water in the studio is a ground spigot we waited nearly 45 minutes to break away the clay and reveal the first section. Once freed from the clay and walls the object was prepared for the second half of the mold. 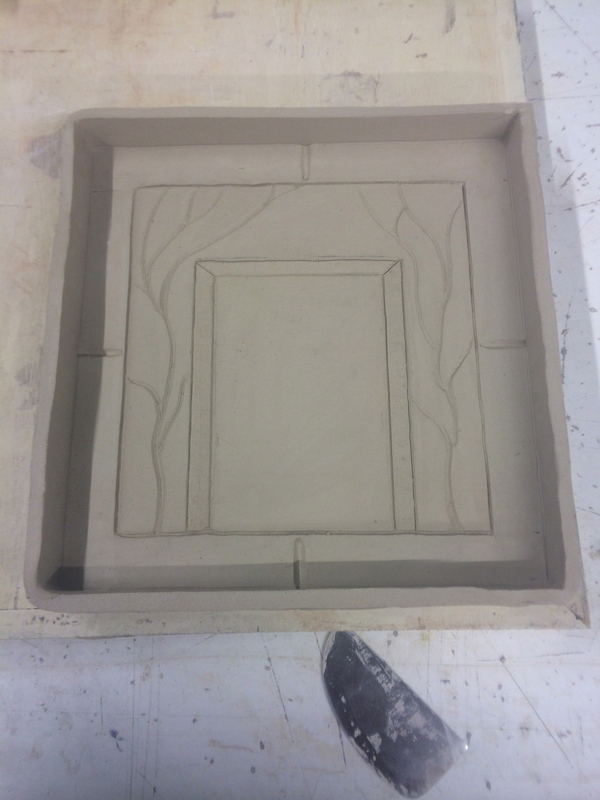 If the master had been bisque, she would have removed it from the mold and thoroughly cleaned and leveled the top of this portion for a more perfect fit. Because the model was green she opted to leave it in place and clean around it. Once clean, it was prepared for the second half of the plaster, including cutting the keys with a penny and filling gaps. Before adding plaster, the water resistance of the model was considered, first with a final coat of soap and then an overall spray of mold release. Without the cottle boards they will need quite a bit of reshaping as well as thorough cleaning to remove the mold soap and curing of the paster before a test cast can be made. If they turn out well the next step will be making mother molds from these masters for the production of working molds. Thank you April! Such a productive and informative day! An important idea for us right now in Foxy-Wolff is to develop an income steam to support the video production and installation, which can be very expensive when considering the tech involved. We have worked with a variety of ideas over the last couple years and continue to search for something compelling that ties to into the heart of the videos. With this latest idea, I think we may have figured it out. These came from a series of small drawings Gabe made as we were on our way home from Kansas after the semester critique last December. While I did like the tiles, I felt they were missing something, and a reoccurring comment we heard during the critique was that everyone wanted to play with the house and the figurines. combining these two necessities, Gabe developed these wall hanging pieces: As soon as we got home I began with their construction. For most of these, the molds already exist from the construction of the houses and so the details on the build could be thought through very quickly. The figurines were made following the construction of the houses and were somewhat different from the originals, the stone woman for example is slip cast for these, where she was carved from solid clay in the original piece. In this we were seeking a way to differentiate the collectables from the gallery originals. These pieces will hang in a variety of ways, the large free-standing pieces will be placed on a custom shelf, while the piece that includes its own shelf will hang on a French cleat. This series does exactly what we were hoping for, It reunites the concept of the films with toys and action figures and gives us an interesting opportunity to return to the “commercial”. I love the idea of promoting the “Collect all five!” marketing strategy for ceramic art, its fantastically absurd. Wall hanging tiles are a new part of the Magic Box project that we have been working on. Like the house, the mold was made for this in July. 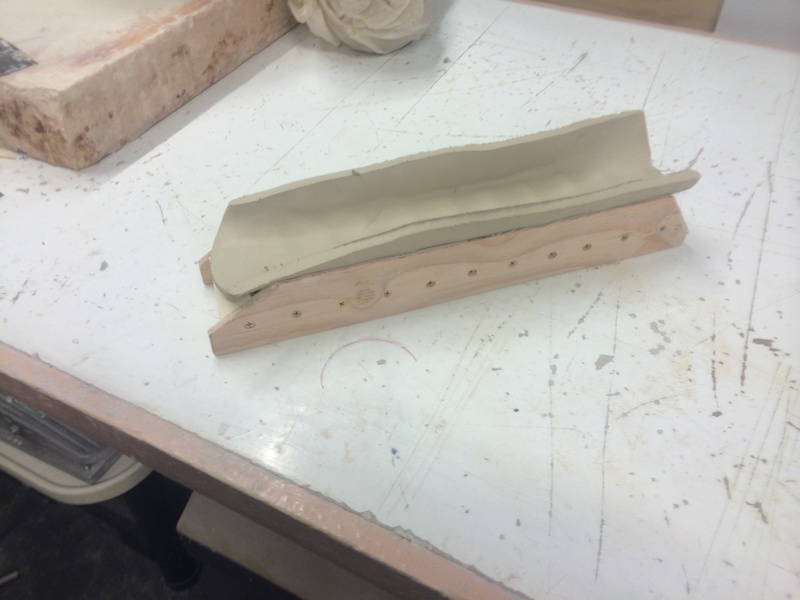 This mold was designed by Gabe and is intended to mimic gallery wrapped canvas. The piece is large (16″x15″x2″) and was constructed initially from wood wrapped in a heavy burlap. The top pic shows Gabe taking the mold apart after the plaster was poured. The piece by piece construction allowed the box to be removed cleanly without damaging the plaster. The second shows the finished piece. Once the mold was dry, we were ready to press. The first slabs for this were 3/8″ and weighed about 15 lbs. This weight was usually enough to build the supports from as well, provided the slab was well-shaped before pressing. The photo of the finished tile really shows off the texture. The initial rules of the press have changed quite a bit as we have made several. The piece is very large for slab work and has major problems with cracking. We have adjusted the support structure, slab depth, dry times, clay bodies and added a waster slab. In spite of all these adjustments, cracking is still a major problem for these pieces. In addition to the technical exploration I have tried several finishing methods for the surfaces, depending on the image and the condition of the tile. The first series depicts images taken from The Magic Box film, These images originated as screen shots and then were translated into paintings or transfers through various methods. These four pictures show the screen shot after photo manipulation and then the finished image on tile. These were rendered in oxide and glaze. This was difficult to control saturation and color gradient and was not attempted again. The other major technique used in the first series was a more graphic approach that relied on decals and glaze effects. I really love these, in part because they work with the cracking a bit better than the heavily image dependent tiles. This graphic approach also relies less on images from the film. Only the house image here is taken directly from the film. The other two tiles are more descriptive of the development of the characters depicted. The second series saw further development of both the technical clay and surfacing techniques. The tile above was too badly cracked to glaze fire and so was epoxides and paint finished. 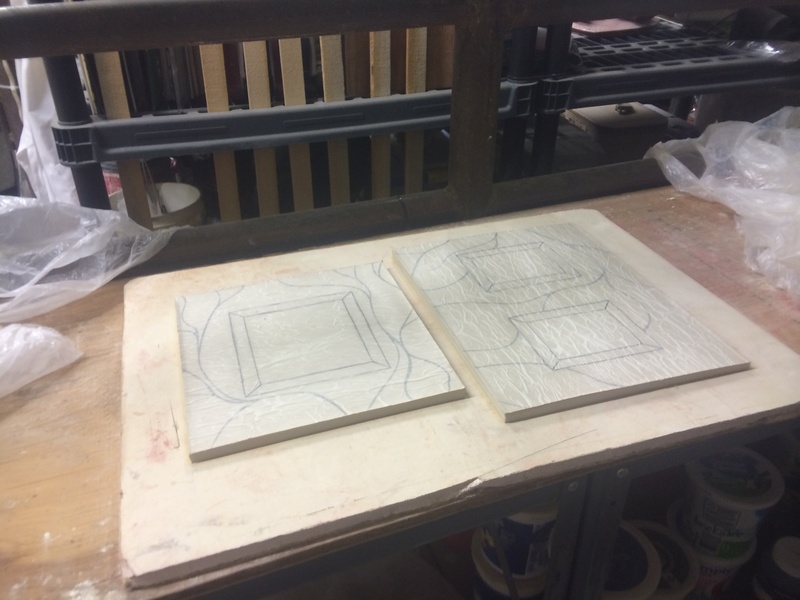 The process of painting ceramic always starts with spray paint for us, the first image shows the tile masked off and the second, the protected drawing after the mask was removed. The last two are the paint in process. The last two tiles combine the techniques used in the first series but rather than oxides, I used commercial underglazes for building the image. These have a painterly quality that I am interested in, but might benefit from more color. The series is ongoing, and will likely continue to evolve. Construction of the house for the film “The Empty Room” began in early September. Or original plan was to space the build out over several weeks and fire stories as they dried, but after a test build we determined that the box construction would require more dry time than anticipated so we opted to push the build into one very intense week. 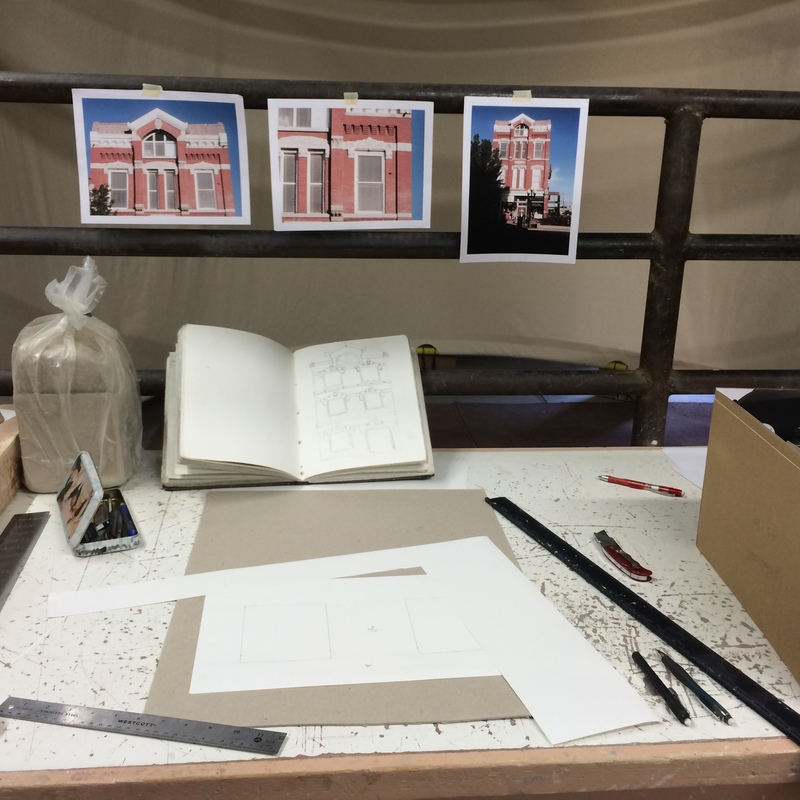 As with all projects we began with prepping clay and pressing the molds, one story at a time. Each story needed about 100 lbs of clay wedged and weighed out into specific slugs to accommodate each mold. Each floor was about 3 days, clay prep was the first. 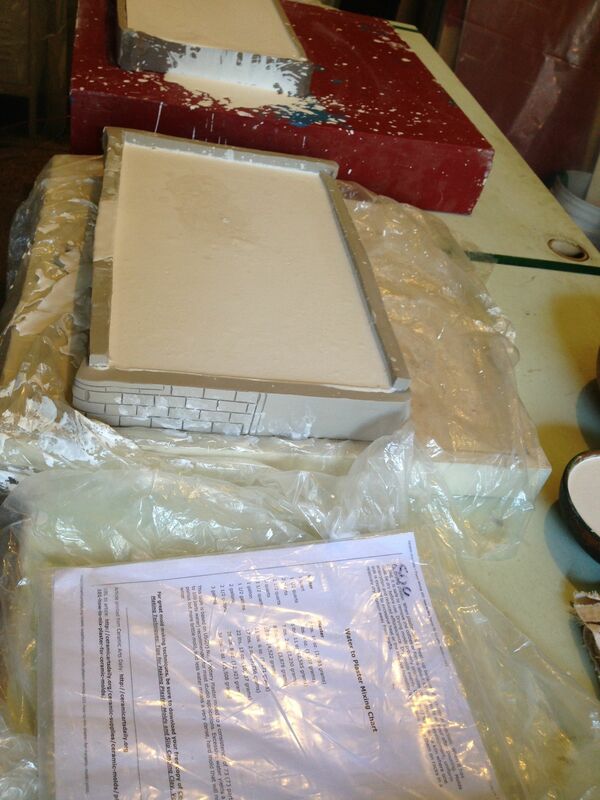 The second day was focused on pressing the molds and preparing the wall for assembly. This was a huge job, as the pieces are very complex and have many details that needed to be prepped on the same day. Not only did we make molds for the build, but also many of the tools were custom-made for the project. This tool was designed to give us perfect cuts on the edges of the walls and floor so we could more precisely control fit. The day following pressing was assembly. The floor was put in place first and the corner with the stairs was attached to the floor. This is the second floor. The cut outs pictured here will be for the staircase on the floor beneath. Once the corner was reinforced and secure, the staircase was attached. We began with the landing and the bottom half and built up from there. These pics are also of the second floor and so include a handrail that is not present on the first floor. The windows were cut earlier on this story to give us access to the underside as the entire stair well is likely to be shown in the film and needed to fe completely finished. After the stairs we put on the remaining two walls were applied. With each wall the corners and other details from the molds had to be tuned back up as handling was somewhat damaging. Once all four walls were in place, the flange was attached to the top and cutting windows and clean up and finish work could be done. Another thing we learned from the test build was that the walls wanted to move quite a bit during the drying process. To control this to some degree Gabe devised a cap to fit into the flange and stay with the floor throughout its shrinking and firing process. This was a fairly last-minute addition to the group of molds and had to be resolved quickly, so the original was made from a combination of wood and clay. The first two floors were very similar and so we could build a skill set from one two the next and refine the process. The third floor was another matter, There are far more windows on this floor and another wall inside the structure. It also has a large facade and a roof. Mold prep was the same in many ways, but with molds we had not yet used in an order that we had not tested, this was the greatest challenge of the project. Because they were made so close to one another we were able to see them wet all at once, which made a great group. Making molds for the house that will be used in our upcoming film, The Empty Room, has been the major focus of the last few weeks. 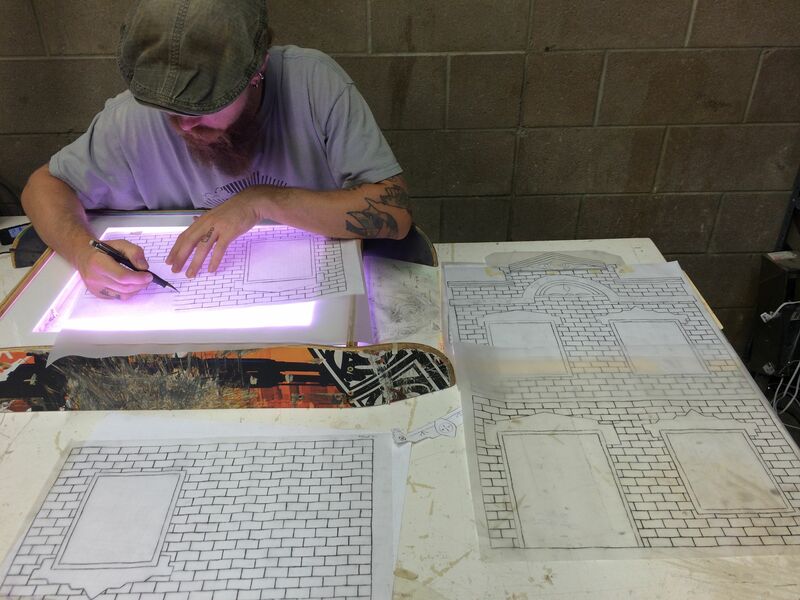 Using the preliminary drawings and the scale model discussed in the last post, Gabe focused on drawing the transfers. These are done on trace paper, using a soft lead and a light table designed and made by Gabe. 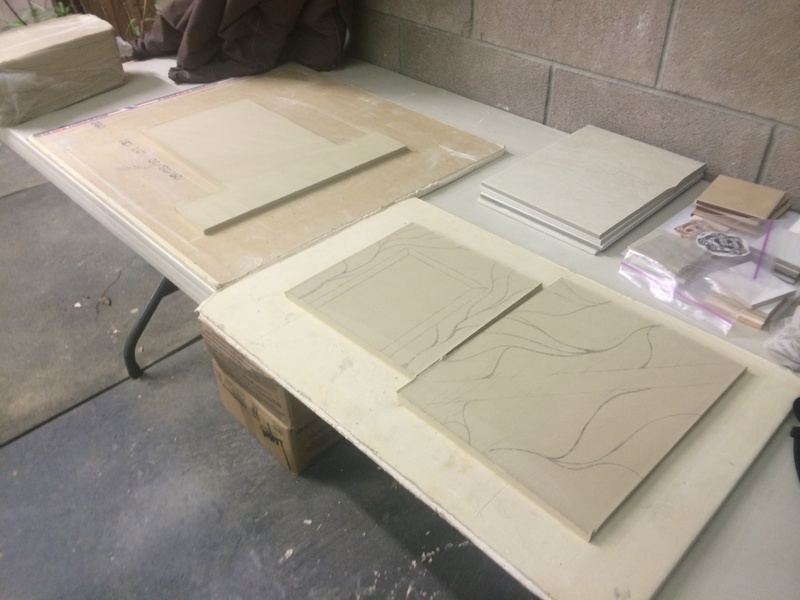 Each of the transfer pages is an exact map of the clay tile that will be built. The light table is necessary so the transfers are not backward when they are placed on to the clay slab. 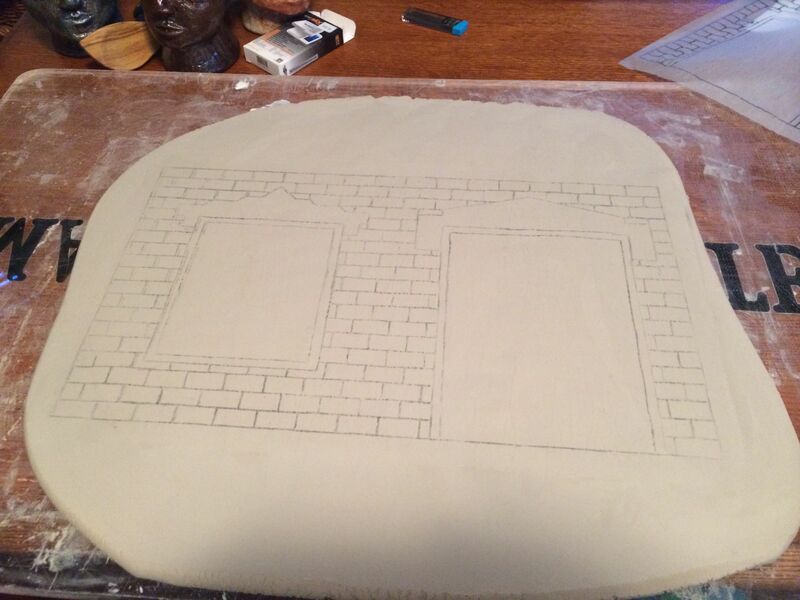 The trace paper is laid, graphite down, onto the clay surface and smoothed out. The paper begins to wrinkle and distort almost immediately so this step must be done quickly and precisely. 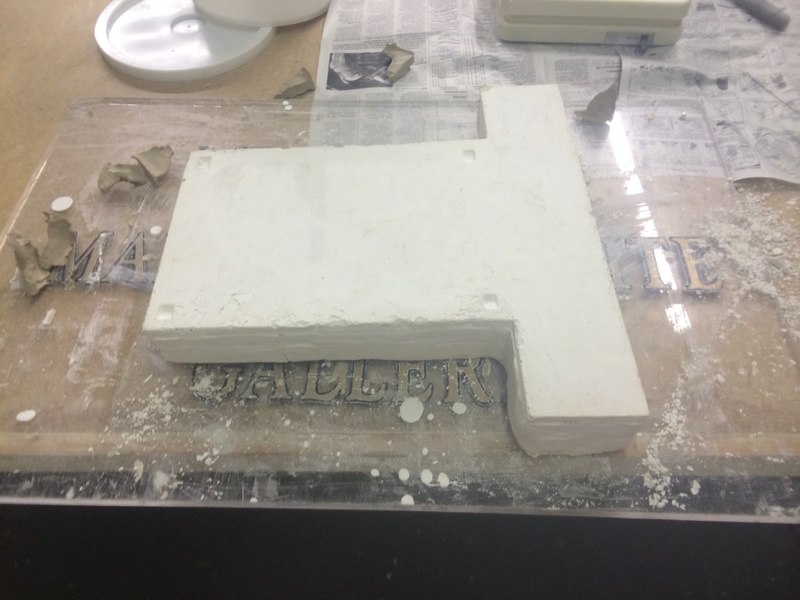 Once the sheet has had full contact with the clay and is lightly compressed onto the surface, the paper is removed and the clay is ready to work. The first step was to trim the borders of the wall. 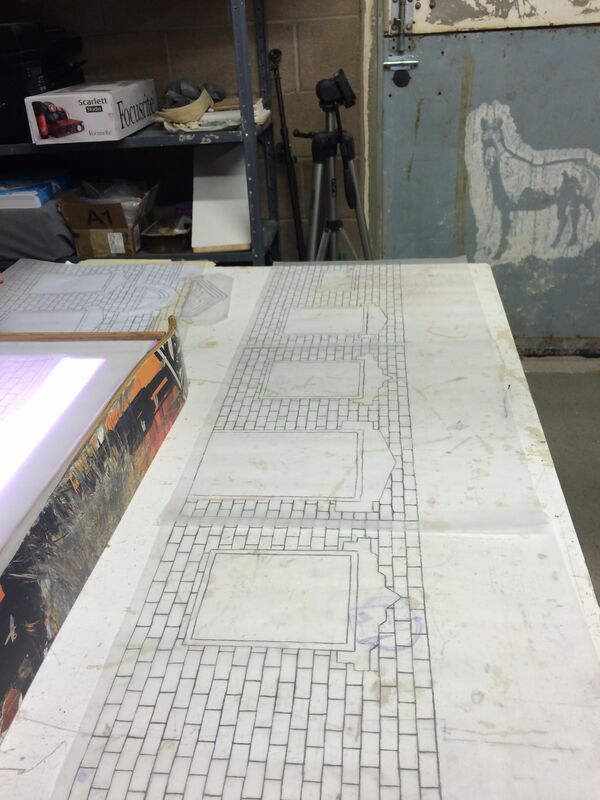 Next, the masonry joints were pushed into the slab along lines indicated by the transfer sheet using a custom rib that Gabe made for the purpose. These lines needed to be exactly the correct size and completely uniform, no tool we had, was able to give exactly what we were looking for, so making the tool was necessary. 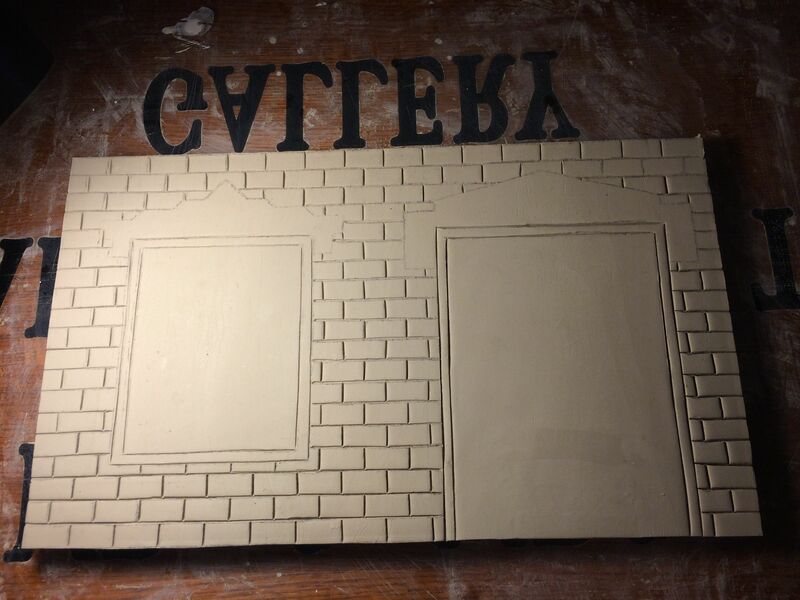 Once the tile was completed, clay walls were built in preparation for plaster casting. 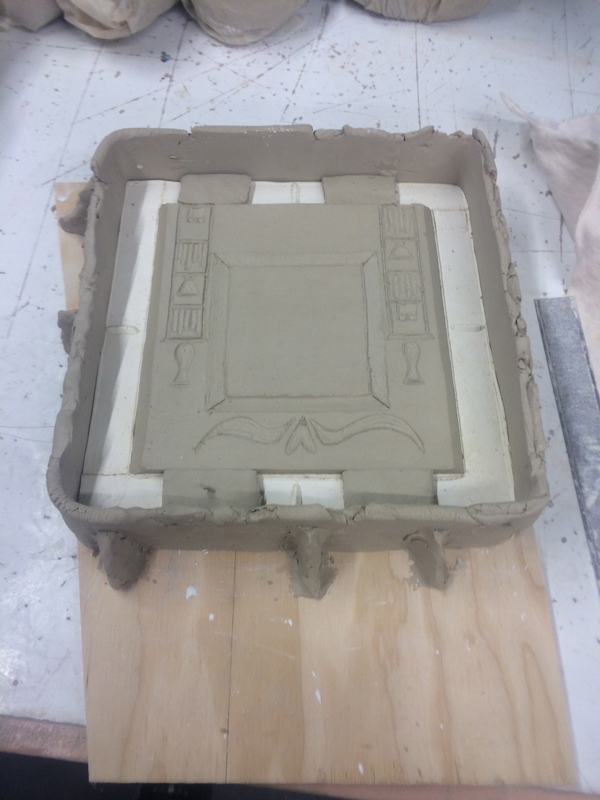 Shrinkage was a major factor as we need the closest size uniformity possible among the tile molds so each of them was cast no more that 12 to 18 hours after they were made. 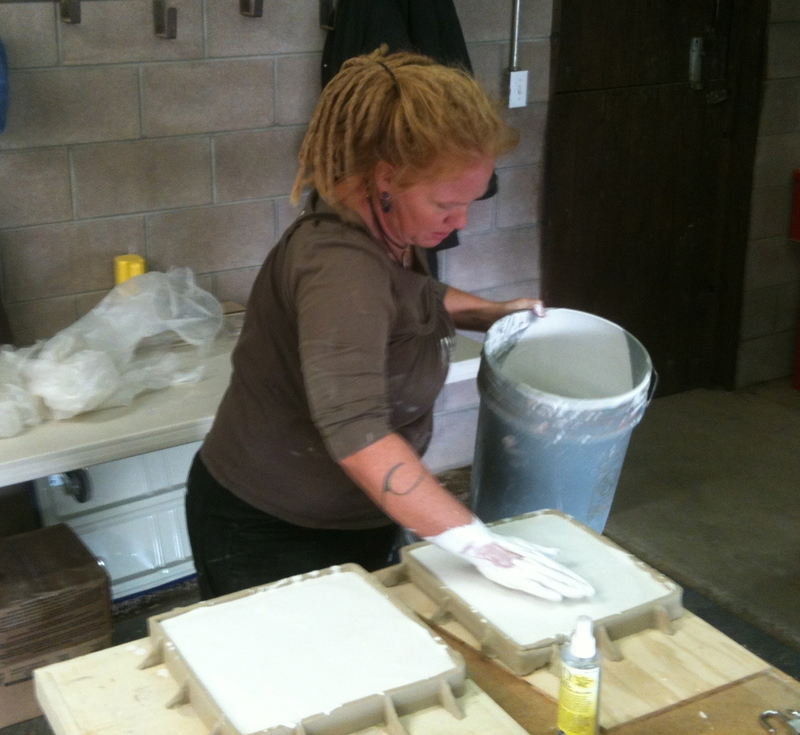 Using the paster formula from ceramicartsdaily.org, the tiles were cast. 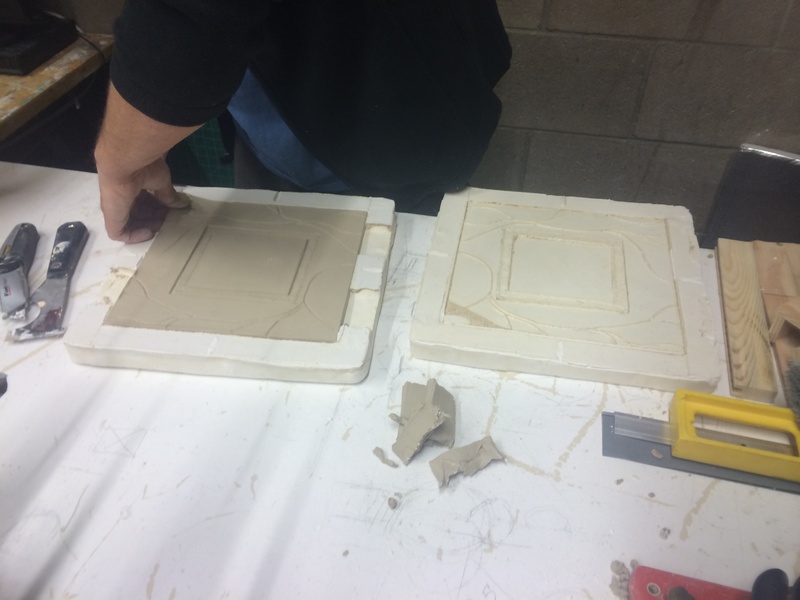 We ignored the 1″ border that is conventional in mold making so the tiles could be cut exactly to size, using the mold itself as a guide. This makes the molds extremely fragile, we are using great care in storage and drying. Each wall needed its own mold because of the intricacy of the brick detail which is correct for structural brick. In addition to the brick pattern, the third floor has many architectural details and each of the panels needed a full redesign. 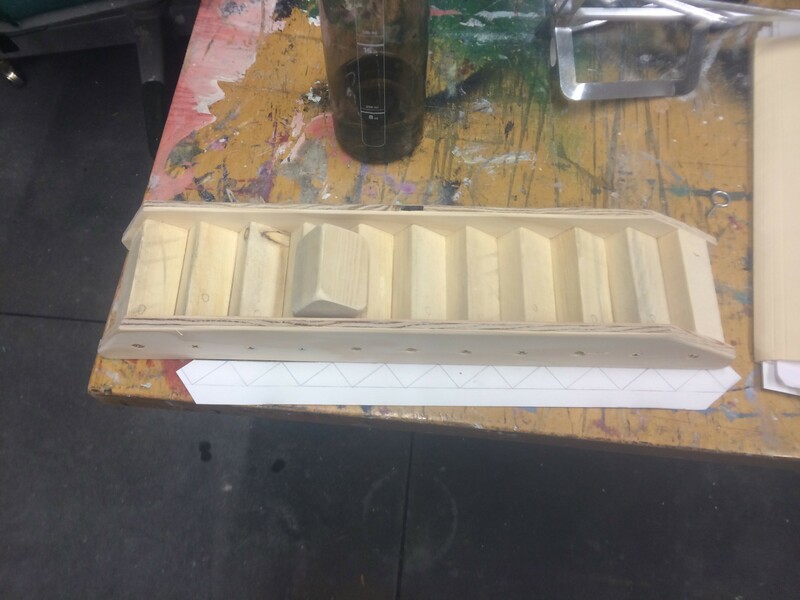 At this point we have 13 molds completed with many internal details to continue to resolve, but it is encouraging to see the project so well on its way. As the breeding season has been winding down, we have finally been able to give the next house in the Magic Box project some serious attention. The outline for the script has been done about a month, which is a huge advantage in that we can solve problems in the building before it is built. 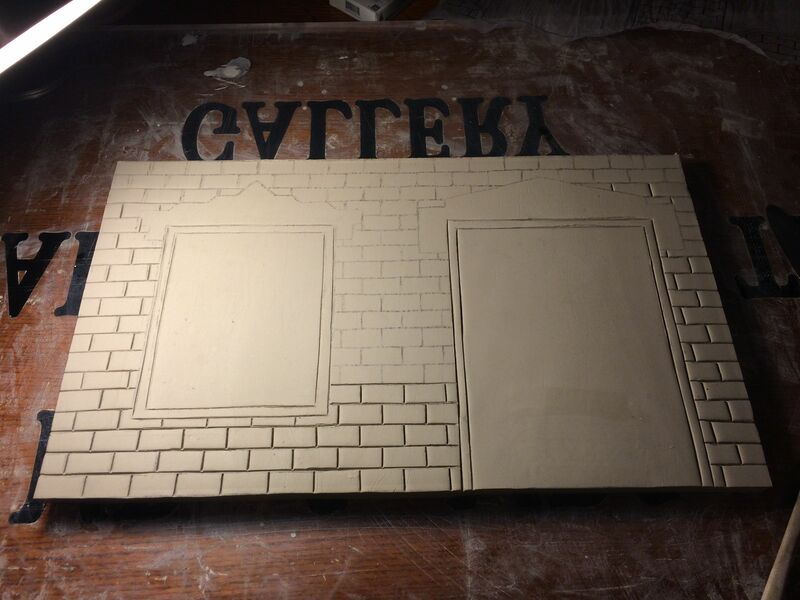 We chose to use a building from our city, Pueblo Colorado, for our model. 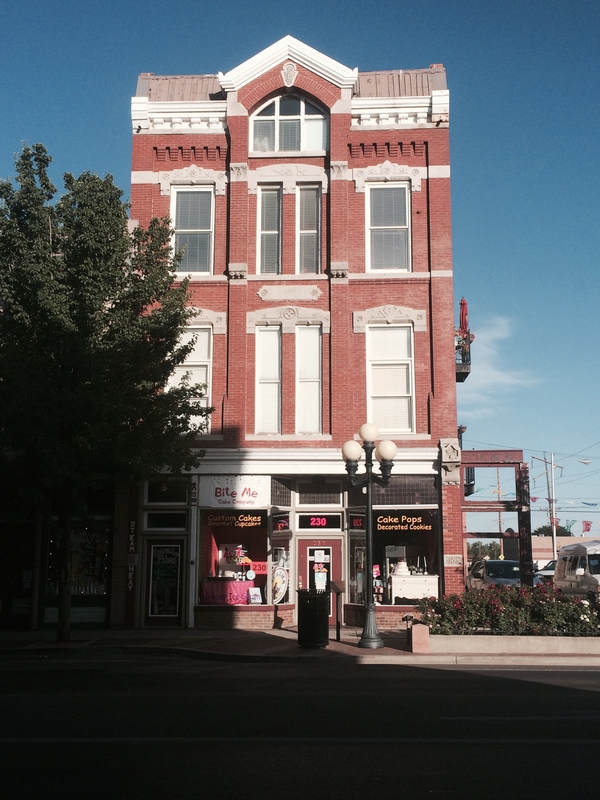 This is 230 Union Ave, likely built in the early 1900’s, along with most of the architecture in that area of town. Once the building was chosen and photos taken, the next task was to simplify it and choose details that would carry forward to the model. This quick sketch done at my kids karate class was the beginning of the process. We have several needs as we design these buildings. For me, the first priority is the art and craft of the ceramic object, I want the work to be complex and compelling. Strong attention to details give the work an overall feeling of mastery and solid construction allows the piece to survive its constant handling. Gabe’s top priority is its function as a film set. Careful attention is given to the window and door openings for camera access and the movement of the characters within the space. The object has to serve the story as well, this three-story building has a restaurant on the first floor, which will require a larger cast and more furniture and so must be somewhat larger. 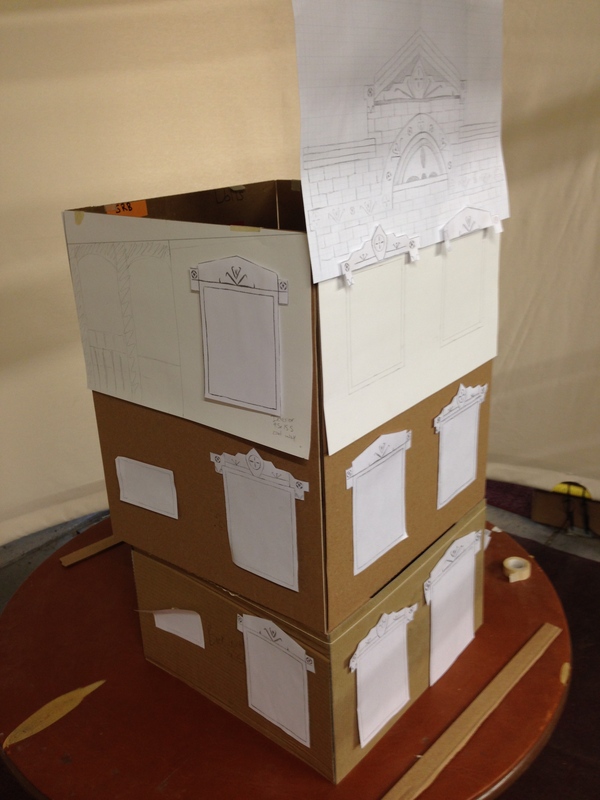 We used cardboard models to conceptualize the interior space, especially the stairs and furniture placement, which will be a complex problem. Next ,was to make scale drawings of all of the individual pieces to be used in the construction of press molds, which are used to ensure uniformity of each element so precise fit can be achieved. My discovery of graph paper has been a tremendous help in this process. I’m spending a fraction of the time on this process compared to past projects. This conceptual stage is possibly the most difficult in collaboration because there is no physical object to discuss. To get around this Gabe suggested we build the entire piece in card board so that the details can be clearly understood by both of us, which allows us to work effectively and eliminates the feeling of wasted time on un-communicated ideas. 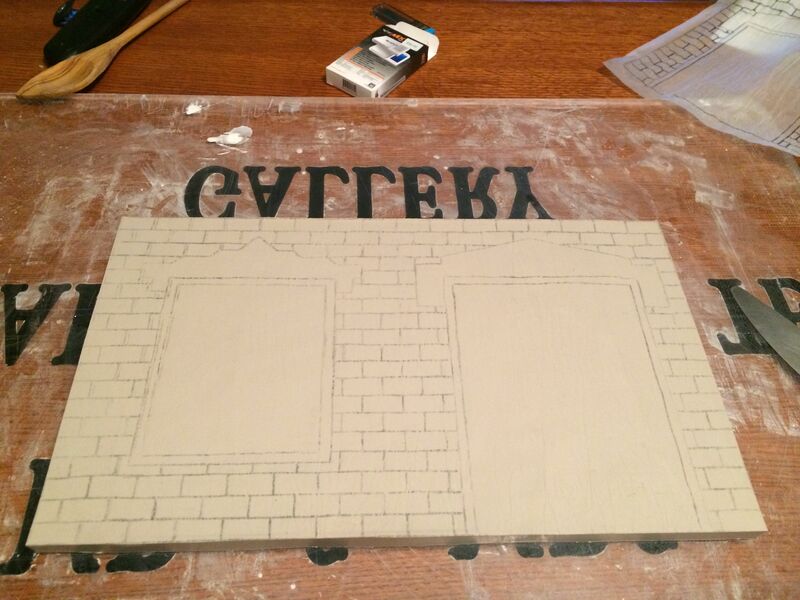 Our primary consideration in the early part of this process was to work out details of the windows and doors so the brick texture can be applied correctly, but it has been a hugely useful tool and we are continuing to use it to consider engineering and aesthetic questions as they arise. Today, Gabe finished the roof detail, which really begins to pull the building together. A note to non ceramists, all the size dimensions are wet, clay shrinks throughout its drying and firing process. Shrinkage has been calculated at approx. 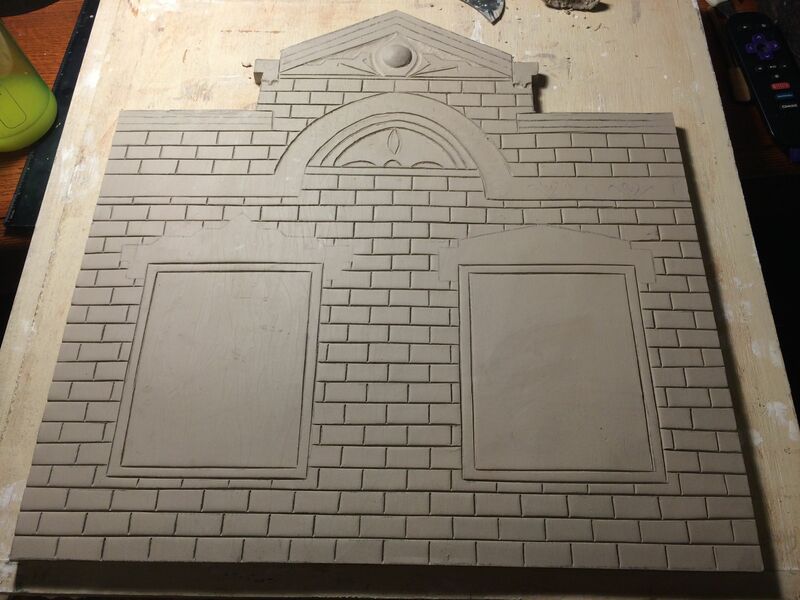 12% for the clay body we are using for this piece, making the finished house somewhat smaller than shown. The next major project for Foxy-Wolff is another play set/ film project. The earliest inspiration for this piece comes from Barbie’s Dream House, but early concept is as far as the influence goes. This work was conceived of at the same time we dreamed up the LLICPS, but is so much more complex to build and film that it has taken a great deal of time to manifest. Our first job was to decide on the scale of the piece. We were wanting a larger piece than our small kiln would allow so modules were the best solution. Another priority of the piece was a high degree of precision. Molds then became the best solution for the build. 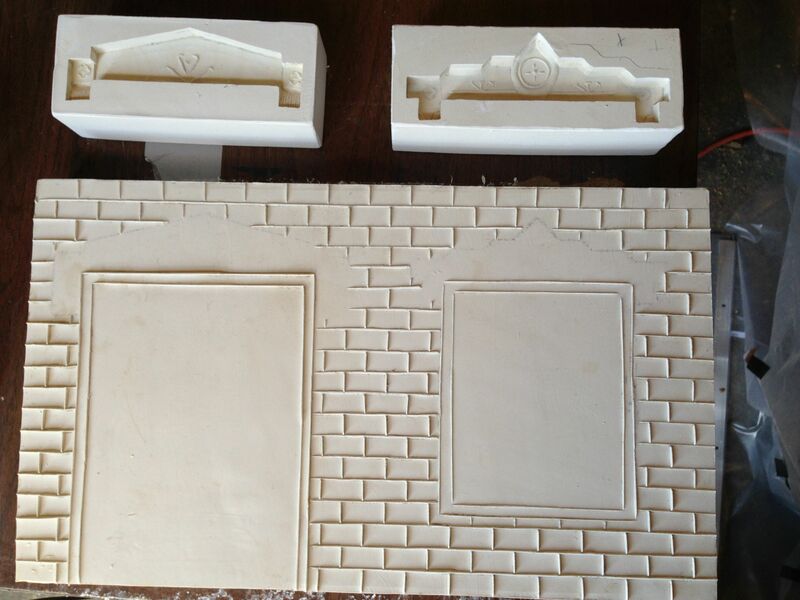 Several ideas were pursued, but in the end a two-part press mold was decided on, allowing uniformity of each wall with both inside and outside detail. 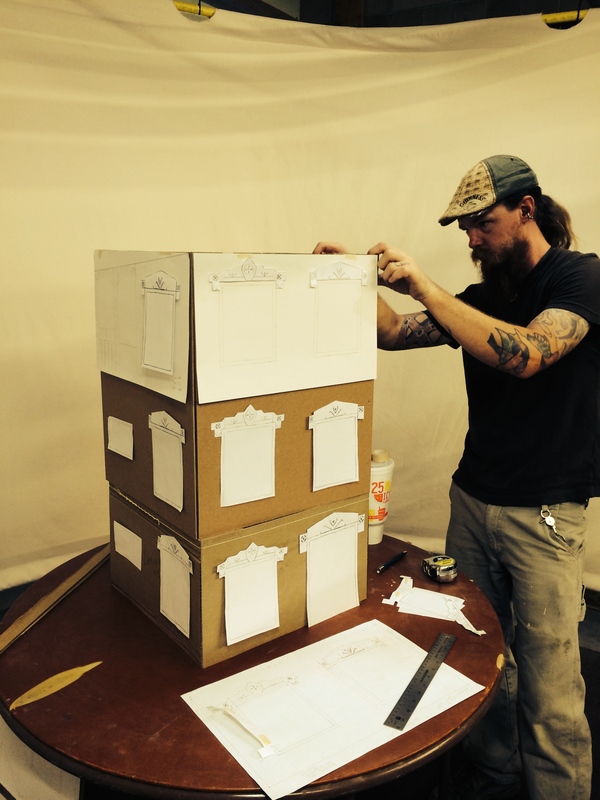 When making a doll house, better follow the rules of doll houses. Each wall would then need two parts, a floor, a ceiling, a roof joist, roof tiles, trim work, gables, and a staircase; in total 15 separate molds were made. Originals were the first step, after determining desired finish size and calculating shrinkage, patterns were created from heavy paper. 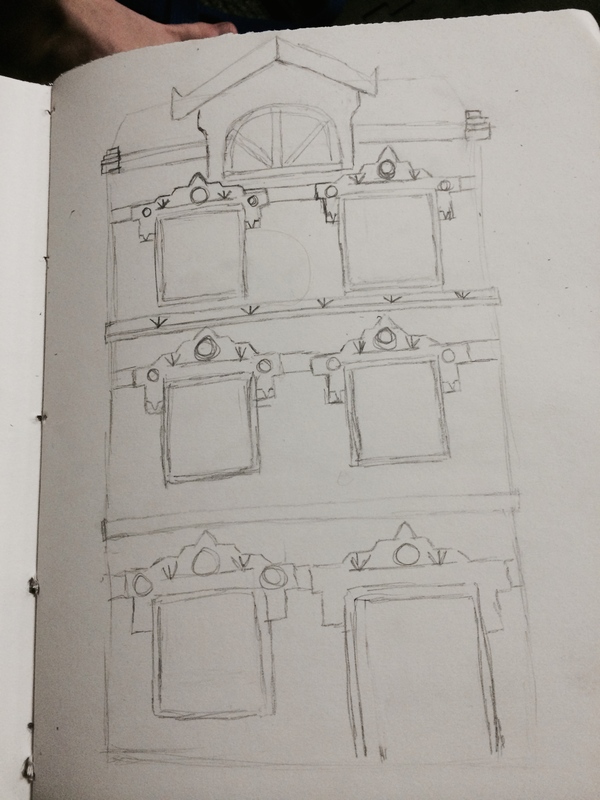 all the decoration was applied to the patterns, then transfers were made using graphite and tracing paper. After the transfer process and the tiles were cut, the decoration needed to be removed from the original. 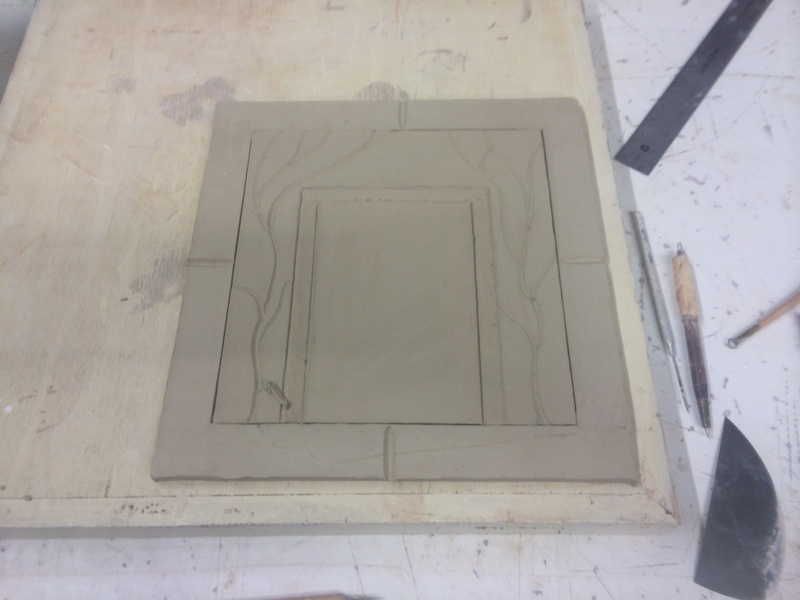 A border was then added to the tile to provide a wall for the mold. Registration marks were also cut to help the molds fit back together after the original was removed. Walls were then built and secured in preparation for the plaster. 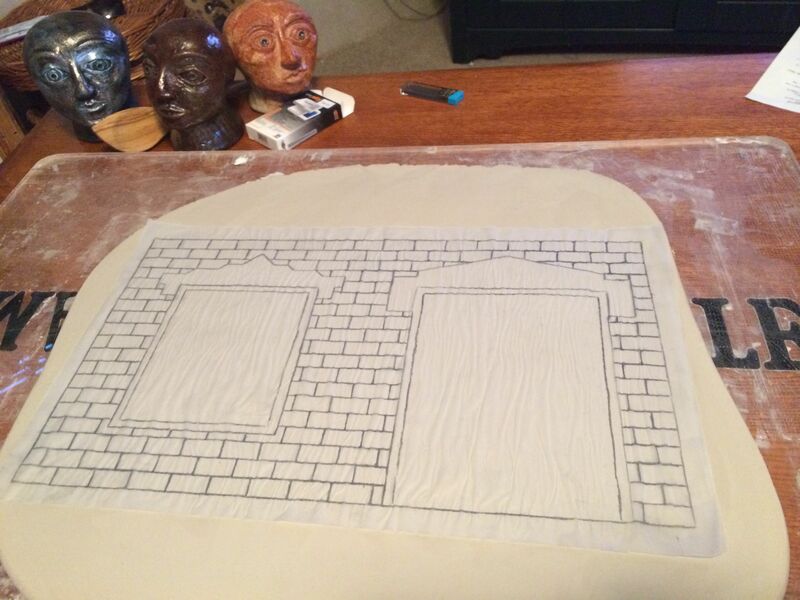 once the first side of the wall was poured, the walls and the border was removed and the interior received its transfer image and was carved and prepared for plaster. Early on we could see that an escape route for the clay was essential. the tabs at the top and bottom were added to create voids to allow this. in the end this was not quite enough and plaster had so be dug from the window voids as well. Another tricky issue with these was the need for the window openings to line up inside and outside. The plaster was added again. For our plaster mixing formula we follow the one provided by ceramic arts daily. The basic advice here is excellent and the ratio is nearly always perfect. The small batches seems a bit watery, we typically add a little plaster when mixing small. After a few days of drying, the molds were broken into so that the original could be removed and the mold left to dry. At least a week, but the longer they dry, the better the molds become. As mentioned above, they piece required many details. The mold making phase of the project lasted weeks. The stairs proved a different sort of challenge. As I said, precision is a high priority for the project, I was unsure of how to get what I wanted with clay and keep it crisp through the build and pour. This bit was handed off to Gabe and he engineered and built this beauty in a couple of hours. This mold was not only huge time-saving but its crisp lines really makes the look of the piece. 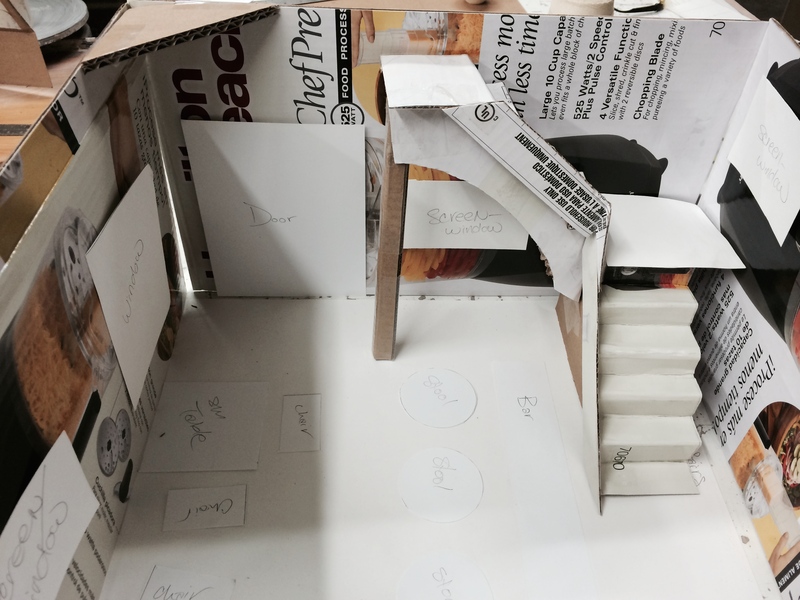 The roof and the ceiling were difficult to design, this is how the module aspect of each floor works, with locking tabs in the floor and roof of each story. Also critical is tying the porch to the stairs so that the characters can move from floor to floor smoothly. Once the molds were built we had to learn how to use them. The stairs were a particular challenge, keeping that crisp line and filling all of the cracks and gaps took several tries and approaches. As the molds were dried and their techniques for use were understood, we were ready for the build. More on that soon.